If there is anyone who takes fashion seriously and has fun with it, it's Sarah Jessica Parker. Yesterday evening(September 27th), she attended the 2018 New York Ballet Fall Fashion Gala in New York. SJP hit the pink carpet wearing a vibrant red GILES high-low hem, bubble gown, featuring puffy shoulders, a v-neckline and sheer sleeves. 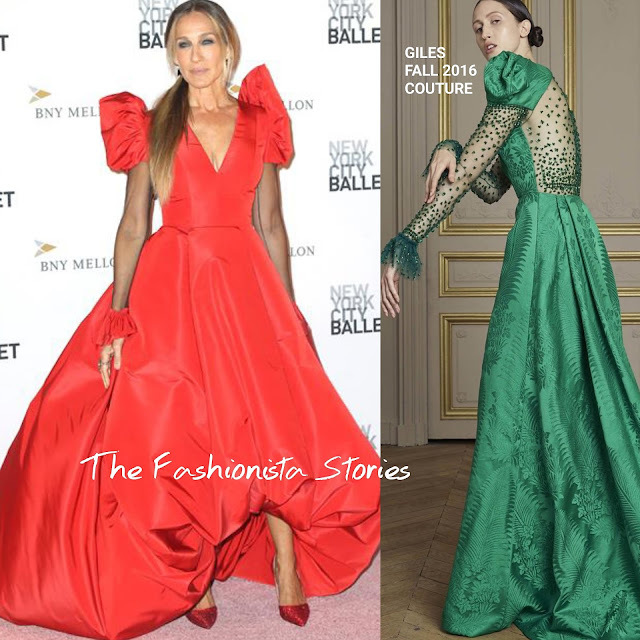 SJP's gown is inspired by a gown from the designers FALL 2016 COUTURE collection. I actually prefer SJP's interpretation of the gown. Wearing her signature smokey eye, she finished up with a ponytail, FRED LEIGHTON jewelry and red pumpa from her shoe collection.